The most commonly used score is the FICO credit score, named after the company that created it – the Fair Isaac Corporation. This score ranges from a low of 300 to 850. A score of around 750 or higher is considered excellent. Fair Isaac keeps the exact formula used to derive the FICO score secret, but they do publish the five components and their weights used in determining your credit score. By focusing on these five things, you can be on your way to an excellent score. The payment history category looks at how consistent you have been in paying off your past debt. This is the most important factor taken into account in calculating your credit score. All you need to do well in this portion is pay your bills on time. It’s that simple. Your past track record on paying your bills carries so much weight because it shows lenders how likely you will repay loans on time. If you have missed a payment here or there, lenders will deem you a higher risk of missing another payment in the future. Whatever your bills are, whether it is a car loan, mortgage, credit cards, or student loan, be sure to pay them before the due date. Some bills such as utilities, rent, and cell phone might not be reported to the credit bureaus if they are late, but you should still pay them before they become way past due. Once those bills are sent to a collection agency, they can show up on your credit report and affect your credit. Negative items such as late payments, foreclosures, collections, and some bankruptcies can remain on your credit report up to 7 years. A chapter 7 bankruptcy will take up to 10 years before it is removed. Even if you do have blemishes on your credit history, keep in mind that the older an item is, the less it will affect your credit score. A late payment that is 3 months old will hurt your score more than one that is 3 years old so you should always keep on top of your bills. The second largest factor that affects your credit score is the amount of debt that you owe. Known as your credit utilization ratio, it is how much debt you are carrying versus how much total credit you have available. Calculating your credit utilization ratio is easy. If you owe $1,000 across all your credit cards and you have a total credit limit of $10,000, your ratio is 10%. Revolving balances, such as those from bank credit cards and store credit cards carry more weight than installment debt such as mortgages. As a good rule of thumb, you should keep your credit utilization ratio at or below 30%. The reason this component has the next highest weight in your credit scoring is because when lenders see someone is close to maxing out their credit cards, they could be falling behind in paying their other bills. Maybe they had a major financial emergency or they lost their job and are using their credit cards to pay for their day-to-day living expenses. Because your credit utilization ratio is affected by how much credit you have available, closing a credit card account could increase your ratio and negatively affect your credit score. Sometimes it might not even be something that you’ve done. A credit card company could reduce your credit limit or close an account because it has sat inactive for too long. One thing to note: You don’t have to pay off your balance before the statement closes to try to show a zero balance on your credit usage. Issuers usually report your balance to the credit bureaus at the close of the statement. Paying your credit card by the due date is usually good enough if you are under the 30% credit ratio. For this reason, I always recommend paying off your entire credit card balance whenever you are able to. Not only will you be keeping your debt-to-credit ratio low, you are not paying interest charges. To earn an excellent FICO credit score in the eyes of lenders, the longer you have had credit, the better. Lenders want to see borrowers with experience using and managing credit successfully along with a history of paying back their loans. When determining the age of your credit accounts, FICO evaluates the age of your oldest and newest accounts, and the average age of all your accounts. Accounts that have been paid in full and closed will still appear on your credit report for up to 10 years from the date of closure or last activity. This means depending on how old your accounts are, closing an old account you’ve had for most of your life could shorten your credit history if you don’t have many other accounts. It is possible for someone who have paid off all their loans and canceled all their credit cards to not have a credit score anymore if enough time has passed. While it might seem reasonable to keep credit cards open to help your score, it may be better to close them if you are paying an annual fee for cards that you are no longer using or if having those cards available would tempt you to go on a spending binge. 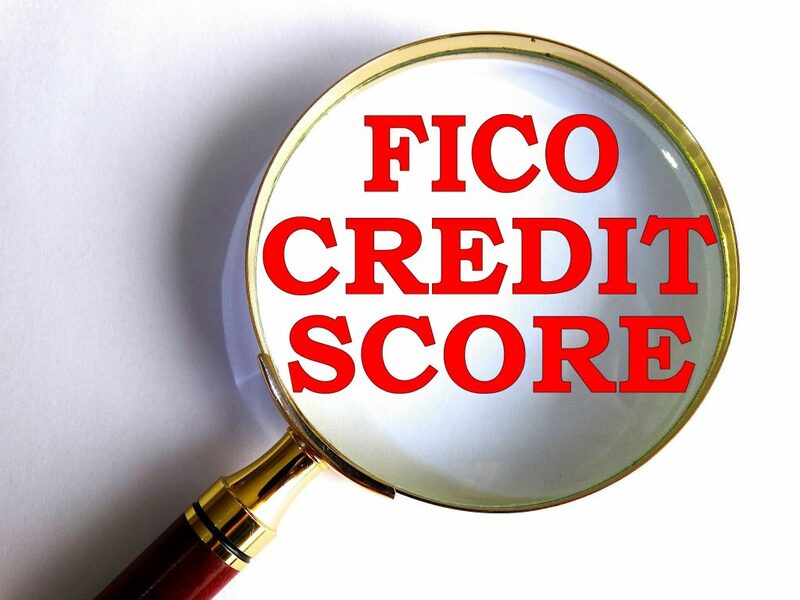 The FICO scoring algorithm takes into consideration the number of inquiries appearing on your credit history. Each time your credit report is pulled, there is a minor negative effect on your credit score. This is because research has shown that someone who is suddenly applying for lots of new loans might be more likely to be late repaying those loans because of recent life events necessitating them to request additional credit. A hard inquiry occurs when you are applying to borrow money from a lender. Examples of hard inquiries are car loans, student loans, mortgages, and applying for a credit card or apartment rental. Hard inquiries are when you are the one who is making the request for a new line of credit. A hard inquiry will usually drop your score a few points. When you are shopping around for rates for car loans and mortgages, your credit many be pulled multiple times. FICO gives you a 30-day grace period to account for this. Hard inquiries will remain on your credit report for 2 years. The other type of inquiry, a soft inquiry is done when your credit report is pulled by a person or company to check if you eligible for something. Types of soft inquiries include you requesting your credit report at AnnualCreditReport.com, credit card companies seeing if you qualify for a new credit card, an existing issuer reviewing your reports, or an employer verifying your credit in a background check. Soft inquires do not affect your credit scores. They are only visible to you and stay on your credit report for 6 months. Utilities, cell phone and internet providers, and insurance companies may do either a hard or soft inquiry when you sign up for service. If you are concern about the number of inquiries showing on your report, you should ask whether they do a hard or soft pull. If you want a top FICO credit score, you will need to mix it up a bit with multiple types of credit. You can get into the 800 range with a single credit type but if you are someone who strives to be the best in everything, FICO’s scoring formula rewards people who are able to manage a variety of credit successfully. Types of credit that FICO considers include mortgage loans, bank credit cards, retail store credit cards, gas station credit cards, and installment loans such as auto and student loans. Knowing how FICO credit scores are calculated helps you be a better credit consumer. By identifying what components you need to work on, you can boost your credit score to get you the best rates and the best deals on everything from loans to insurance rates to getting hired by a top employer. Since your payment history and debt ratio makes up 65% of the total score, it pays dividends to focus on paying your bills on time and not maxing out your revolving credit card limits. 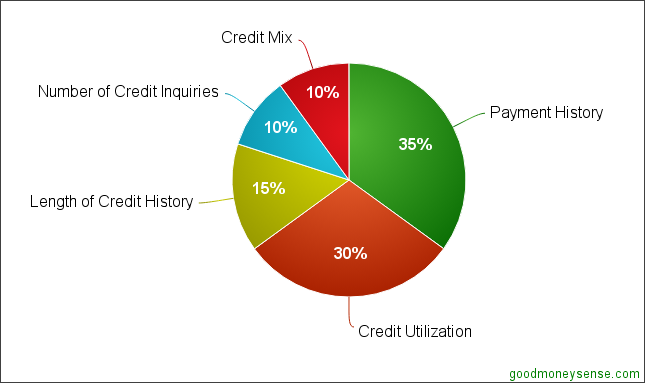 The other three components – length of credit history, credit mix, and number of credit inquiries are harder to control. Your credit history will naturally go up as you get older and wiser. The other two factors only make up 10% of the credit scoring each and should be less of a concern. You shouldn’t be afraid to apply for more credit cards and increase the number of inquiries because it has a shorter term effect on your score than say being late on a bill. If getting a new higher limit card means your credit utilization ratio drops to 30% or less, it will actually have a big positive effect on your credit score. On another note, you shouldn’t apply for a personal loan and pay the interest simply to increase your credit mix unless you actually need the money. Personally, I only have credit cards, always paid my bills on time, and have over 15 years of credit history. My credit score fluctuates between 800-810. A score over 750 is considered excellent and will get you the best rates. Anything higher is for mostly for bragging rights. Any tips for increasing your credit score? What are some things that you’ve done and seen your credit score increase or decrease?